Gleneagles is one of the most famous names in golf. With a rich history woven throughout the story of golf in Scotland, the Perthshire resort has all the credentials to host one of the biggest events of any sporting year. So here are ten things you may not know about Gleneagles, the PGA Centenary Course and its associations with the Ryder Cup. Like many developments in the early 20th Century, Gleneagles has the railway to thank for its conception. Donald Matheson, General Manager of the Caledonian Railway Company, was holidaying in Strathearn in 1910 when it struck him as a perfect venue for a 'Grand Hotel' with golf courses providing the perfect past time for the paying guests. Guests who would of course arrive courtesy of his company's trains on their railway line that ran through the valley. Another railway man, due to his fear of flying and ocean travel, was five times Open Champion James Braid who was invited to design two golf courses at the new resort in December 1913 for the princely sum of £120. Not surprisingly the Great War of 1914-1918 hindered development, but the new King's and Queen's courses were opened for play in 1919. 3. The First Ryder Cup? History tells us the first official Ryder Cup matches were played in 1927 at the Worcester Country Club in Massachusetts, where the hosts came out on top 9½ to 2½. However an international match held at Gleneagles in 1921 can lay claims to being the forerunner of the competition. As an encouragement to get US professionals to play in The Open, a match was arranged against professionals from Great Britain, featuring players such as JH Taylor, Harry Vardon, Ted Ray, James Braid, Walter Hagen and Jock Hutchinson and the home team won 9-3 and the connection between Gleneagles and the Ryder Cup was born. American Hutchinson went on to win The Open that year, so the trip was worthwhile for him! Whatever the status of the 1921 match in relation to the Ryder Cup there is one solid gold connection between the two events. One player on the home team was the English professional Abe Mitchell, personal professional to Samuel Ryder, the Hertfordshire seed merchant so taken with the game he became instrumental in establishing the transatlantic contest. Such an event would of course require a trophy and at the cost of £250, Mappin & Webb of Mayfair, created the famous solid gold Ryder Cup, topped with a golfer modelled on Ryder's friend and tutor Mitchell. Now world renowned as a five star golf resort, Gleneagles was a little short of that standard at the time when the 1921 matches were played with Matheson's plans for a grand hotel still to come to fruition. As a result the American team had to stay in railway carriages and they were forced to fetch and carry their own water. Rest assured, this is not a problem that will be faced by the modern professionals of both teams when they arrive in Perthshire in September! Designed by Braid and hewn from the rugged Perthshire countryside, the King's and Queen's courses were opened in 1919 and quickly became established as classic layouts, attracting visitors to stay at the Grand Hotel that followed in 1924. The King's hosted a famous match between the 'Big Three' of Jack Nicklaus, Arnold Palmer and Gary Player in 1966 and came to the attention of many worldwide through the exposure of the BBC's International Pro-Celebrity Golf series. The hosting of the European Tour's Bell's Scottish Open from 1987 to 1994 attracted stellar fields, drawn both by Gleneagles' famed hospitality and the timing of the week before The Open Championship. Gleneagles has long strived to host the Ryder Cup and one element of any bid was a course that would challenge the modern professionals in the 21st century. To this end Jack Nicklaus was approached in 1988 to fashion a modern layout on the site of the existing Prince's and Glendevon courses. Nicklaus described the land as "the finest in the world I have ever been given to work with" and the resulting Monarch's course was opened for play in 1993. It was renamed the PGA Centenary Course in 2001 to celebrate 100 years of the Professional Golfers Association. 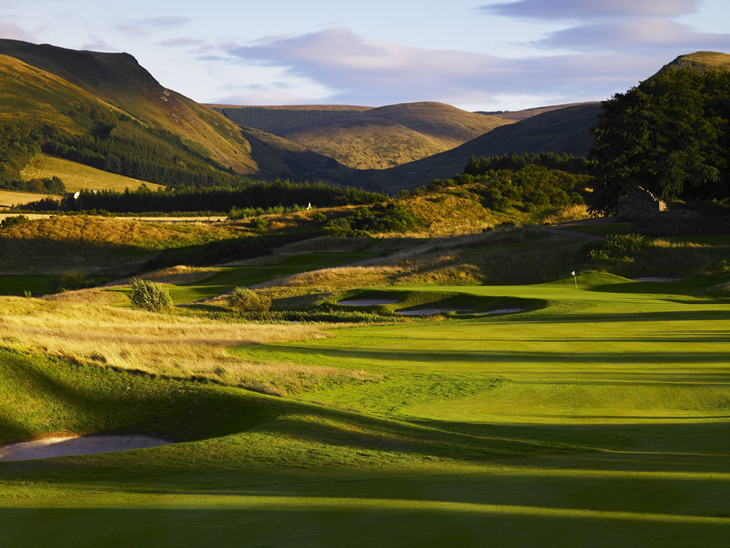 The new course has hosted a European Event since 1999 and gave Gleneagles a platform from which to launch a bid for the Cup. The first European bidding process for the Ryder Cup came to a head in September 2001 with another first - a double announcement of venues for two cups. Scotland and Wales had been head to head throughout, with Celtic Manor leading the Welsh bid and Gleneagles coming to the fore for Scotland, despite strong initial interest from the St Andrews Links Trust in bringing the event to the Old Course. Wales got the nod for 2010 with the Scottish bid, backed extensively throughout the country from government level down, awarded the 2014 matches, ninety years after the Hotel first opened. 9. Did The Earth Move For You? With the cup secured and an extensive time scale in which to prepare eyes turned back to the PGA Centenary Course and work required to produce the classic match play test that the event deserves. Having originally faced criticism that the layout did not fit into the Scottish countryside as well as the King's and Queen's courses, Gleneagles re-engaged Nicklaus and changes were made to 12 holes with all the bunkers being re-modelled for a more Scottish feel. With 50,000 tonnes of earth moved the new course, most notably the re-modelled par-5 9th and 18th holes, it now offers classic risk and reward golf in a setting that is now in complete sympathy with the stunning Highland back drop. At 7,278 yards in length the PGA Centenary is ready to challenge the best and the Gleneagles Hotel is ready to welcome the world to Perthshire. With over 45,000 visitors expected per day the railway will again play a big part in bringing visitors to the event with ScotRail providing a dedicated 2014 Ryder Cup service to transport spectators to and from Gleneagles Station. Let the battle for the Ryder Cup commence!